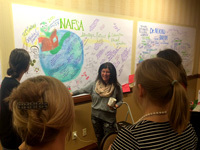 NAFSA recently wrapped up its second Strategic Retreat for Education Abroad leaders. Seasoned education abroad professionals spent two days grappling with the question, “How does education abroad build the global learner?” and what are the implications for education abroad strategy and policy. Neriko Doerr, a cultural anthropologist whose research focuses on education and study abroad, alternative break trips, and language education settings, kicked off this second event with her remarks on “A Guide to Global Learning: The Myths, Ideologies, and Polemics.“ During her talk, a graphic recorder captured the highlights in a visual summary. Read an interview with Neriko Doerr or her Trends and Insights piece. 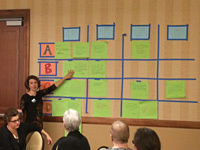 Participants were then invited to design the day’s program collaboratively by offering the questions they wanted to discuss with their colleagues. Session topics featured a range of topics including ‘how does global learning impact identity construction?’, ’how do we address issues of power and privilege with study abroad students?’ and ‘what evidence base is there to support the claim of global learning?’ Participants dove into dialogue on these topics throughout Thursday morning and afternoon. After many thoughtful discussions, participants reflected on their experience of the day, noting the complexity of the issues. The second day shifted the focus from unpacking the complexity of the topic to considering the implications for the work and how to move towards action. Small groups considered how to apply what they had learned to their situation at their institution and brainstorm possible action steps. Each participant worked with a learning partner to help them think through what were the critical and doable next steps. Reflecting on their experience as a whole, participants commented on how refreshing it was to talk with their colleagues in education abroad about education, instead of just about programmatic challenges. Several remarked that the retreat had provided them with the space to ‘raise their head up’ and ‘look around’ to get a broader and deeper perspective on the work they do, reconnecting them to what drew them to the field in the first place. Information on the upcoming 2016 Strategic Retreat for Education Abroad Leaders in Washington, D.C. can be found by visiting nafsa.org/earetreat16. Questions?, email: educationabroad@nafsa.org.